It has been a while since I have posted here, in spite of promising myself I would actively pursue this. But I guess later is better than never so here goes with my first outfit post. PS: Until I manage to set up my tripod at home and find good camera angles, the pictures will be ones taken on my phone. I do not have a photographer. I happen to be one however. So getting on with it. This year seems to be one for modern patterns and i think every fashion house has done numerous takes on florals and camoflage patterns. Florals are not a trend and have been around for a while now whether it be on Aloha shirts or Guayaberas, or on shoes and blazer. But camo shoes and blazers are new, as far as I know. If this is untrue, please educate me. Helped along by Nick Wooster (I love whatever this man wears!) my love for camo printed apparel has grown quite a bit and i got myself a few things to satiate this hunger. 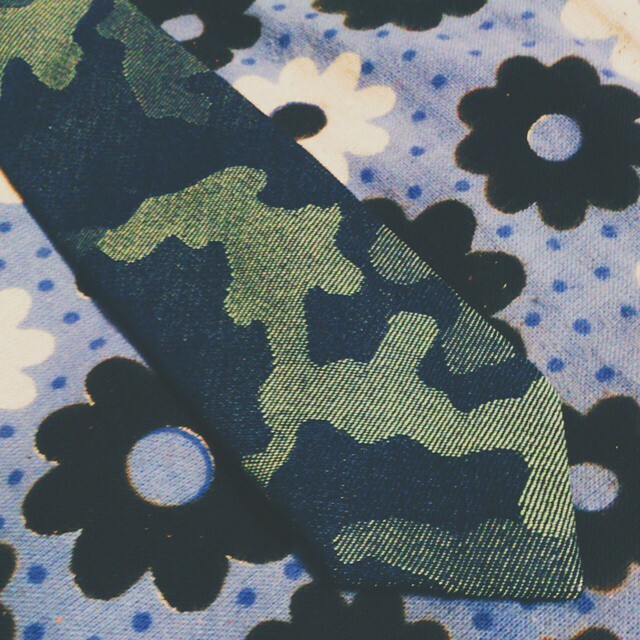 So that’s a chambray camo printed tie i picked up from http://www.asos.com. I was skeptical about a tie made of chambray at first, about whether creating a knot would be easy but with a little work, you can do a good job of it. Not that I do great knots on ties really. 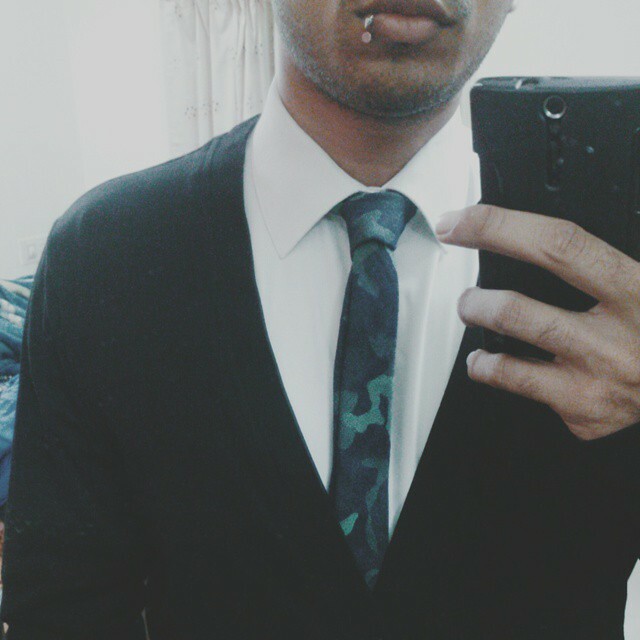 So here it is paired with a white oxford shirt and a black cardigan. I live in the south of India and the weather isn’t great for layering so that’s about all i can manage. 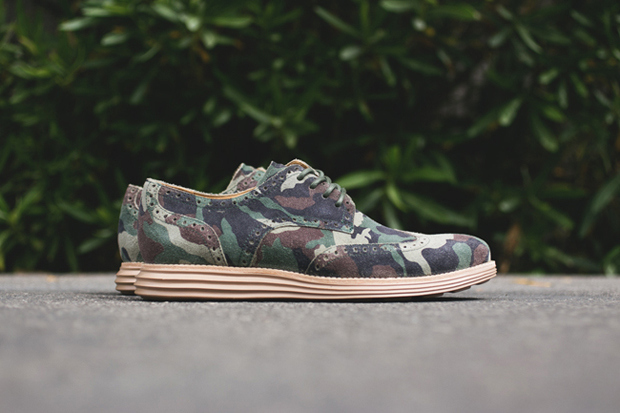 Those are the Cole Haan Lunargrand Wingtips in Camo and after seeing those my search for a pair of camo shoes began in earnest. I did manage to find a pair by UCB and copped them the same day. Here they are. Nowhere as good as the Lunargrands (duh!) but they are good to walk in (canvas=light) and have some little brogue detailing here and there. I am quite satisfied with them. Last but not the least. Socks. I love socks. And i love Happy Socks (www.happysocks.com). They make socks in widest variety of patterns I have ever seen, offer great quality and aren’t super expensive either. 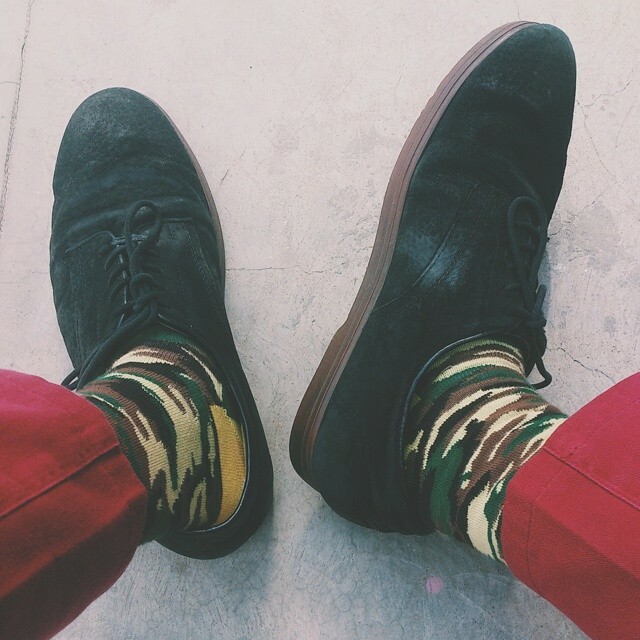 So naturally I finished up my camo cravings with socks. Widely associated with the military and cargo pants, camo has gone casual big time and I love it. What I would like to see, is whether this trend will continue into next year or not because I plan on finding me one of those camo blazers arrgh.